A joint like the shoulder, with multi-planar movement capacity and significant range of motion, is typically less stable than other less mobile structures. The socket is shallow and saucer-shaped, which allows for flexibility, but doesn’t afford the stability of a ball and socket structure like the hip. 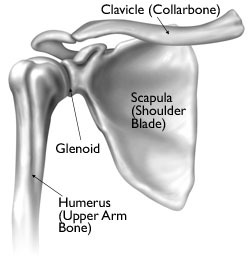 Because the glenohumeral joint (shoulder joint) has the largest range of motion of all the joints in the human body, it has a multitude of tendinous attachments and supportive structures and therefore an increased risk of biomechanical breakdown, which is further exacerbated by the fact that it’s ligaments are relatively weak. This means that stability must come from the muscles and tendons that run across the joint and thus the four rotator cuff muscles are required to be both stabilisers and movers. By stabilizing the shoulder joint as well as moving the upper arm, the rotator cuff provides both control and power in the golf swing. All this means that golfers are highly susceptible to shoulder pain and injury. Furthermore, the golf swing, both in practice and play, demands that the shoulder joint move through pretty much its complete repertoire of movement over and over again! Although golf isn’t considered an overhead sport, it still requires humeral elevation and rotation. Indeed a significant percentage of the full swing sees the arms elevated above horizontal and it is usually at the end ranges of motion (top of the backswing and finish positions) that golfers feel shoulder pain. This qualitative and quantitative combination of horizontal/vertical extremes and volume of repetition during play and practice, constitutes a recipe for shoulder injury. No wonder then that shoulder pain and injury is common in golfers! One aspect in which golf differs from a number of sports is that each shoulder has to perform very specific and very different movements when swinging the club. The leading shoulder is stretched into end range adduction at the top of the backswing and the trail shoulder into an abducted and externally rotated position. Accordingly, this can lead to different pathologies in each shoulder. Whilst both shoulders are prone to impingement and rotator cuff tears, the lead shoulder is prone to acromioclavicular joint pain and posterior instability whilst the trail shoulder is susceptible to anterior and posterior superior labrum tears and anterior instability. Nowadays the swing demands increased torsion by the whole trunk and shoulders in creating power. It’s equivalent to releasing a coiled spring. Today’s professional golfers tend to be hyper-flexible with extreme rotational separation between the pelvis and shoulders achieved during the swing (known as the X factor). This in itself, for the majority of golfers places the body under abnormal stress. 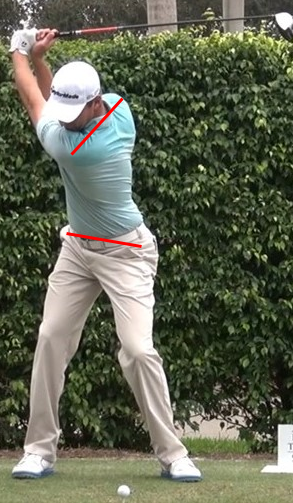 Players with restricted thoracic rotation in the backswing tend to pin the left arm across the chest and even with elite players the search for distance can mean that at the top of the backswing the lead shoulder is placed in extreme adduction, causing a shortening of the anterior shoulder structures with protraction of the shoulder principally by the pectoralis minor. There is an equivalent stretching of the posterior scapular muscles, particularly the rhomboids. Unless the golfer engages in appropriate conditioning exercises to maintain a balanced musculature, over time the asymmetrical nature of the golf swing can cause a disparity between lead and trail side muscle length. In the lead shoulder the pectoralis minor muscle becomes tight and shortened, whilst the rhomboid are stretched and lengthened, resulting in posterior instability in the lead shoulder with increased susceptibility to posterior labral tears, anterosuperior internal impingement and subacromial impingement. Also, the extreme external rotation of the trail shoulder at the top of the backswing means that internal impingement commonly exists between the infraspinatus and the glenohumeral joint. For these reasons, all regular golfers should perform golf-specific conditioning exercises to balance the scapular protractors and retractors. One of the most common causes of shoulder pain in club golfers is a rotator cuff strain or tear. The rotator cuff consists of tendinous attachments to the humeral head; specifically to the supraspinatous, infraspinatous, subscapularis, and teres minor muscles that work together to move the shoulder in multiple planes. The problem is often exacerbated by poor posture. Many golfers have rounded shoulders and C-posture (slouched upper back), which limits shoulder turn, rotation and arm elevation. This potentially forces the rotator cuff muscles into increased, compensatory activity and potential overload. Without conditioning there is every chance that these muscles will not be up to the job. It is an accident waiting to happen! The most common complaint is tendinitis (inflammation of the rotator cuff tendons) but another is bursitis (inflammation of the bursa, a fluid-filled sac that overlies the rotator cuff tendons) and the two problems often coexist, because the tendons and bursa are situated very close together. When the arm is repeatedly raised above the head, as in the golf swing, impingement can occur, causing the rotator cuff tendons to rub together and become inflamed. Rotator cuff tendinitis, bursitis or worse still, tears, can be the result of overuse, poor swing mechanics, or a combination of both. Research suggests the better the golfer the less their reliance on their rotator cuff muscles during the swing and so proper technique is important in preventing injury. Golf rotator cuff problems are more common in the lead shoulder. Many golfers exhibit a strong abductive capacity in the lead arm which would be in line with the asymmetrical (lead-side dominant) nature of the swing. It is possible that they overload the lead shoulder, causing micro-trauma and instability. Accordingly there is, as usual, a combined need to examine technique and to condition the body – in this case to improve the strength and flexibility of the rotator cuff muscles in both shoulders to enhance muscle performance, restore balance and reduce susceptibility to injury. The muscles in the upper and mid-back are very important for healthy shoulders and a proper golf swing. The four rotator cuff muscles attach from the scapula to the shoulder and function to stabilize the shoulder joint during movement. For them to do this, the shoulder girdle itself (scapula) must also be properly stabilised by the muscles in your upper and mid-back. When properly conditioned they help to allow proper shoulder motion for an efficient golf swing. However, if the functionality of these muscles is compromised, then the deltoids, upper trapezius and levator scapulae muscles will likely try to compensate, which eventually will also cause shoulder pain and injury.